Just before the weekend landed, iPhone hacking veteran @chpwn (known in real life as Grant Paul) sent out this tweet, implying the iPhone 5 may have actually been jailbroken. Paul's indirect micro-blog message remarked, "Taller screens like Cydia too. :)" and included a screenshot of a five-row home screen with Cydia installed. Although details have remained scant since the tweet, All Things D managed to post a few nice photos of an ostensibly jailbroken iPhone 5. It is unknown what this means for A5 devices, like the iPhone 4S and iPad 2. 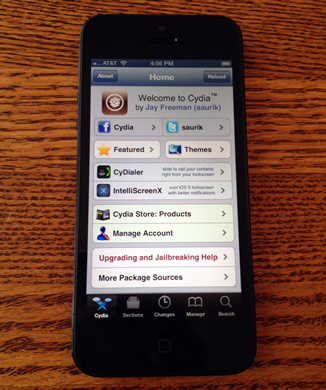 The possible news of a working iPhone 5 jailbreak should be encouraging for modders and hackers. Although iOS 6 itself was instantaneously jailbroken, hacking the OS on newer devices was expected to take much longer due to hardware-based security mechanisms and restrictions. As we pointed out last week, bypassing these measures on the A5 CPU earlier this year took months to accomplish -- it was no easy feat. As a result, many enthusiasts figured the A6 processor would pose a similar, if not more difficult challenge. Even if the accomplishment proves to be authentic though, it will take time before an official jailbreak tool is publicly released. Most iPhone 5 owners will need to sit tight until more details surface. While we're talking about jailbreaking though, it's worth mentioning that iOS dabbler Ryan Petrich claims to have ported Google Maps from iOS 5.1 to iOS 6. This is particularly noteworthy because of the widespread dissatisfaction generated by Apple's new, in-house mapping solution. The project is said to still have some rough edges (i.e. instability) but at least Petrich has shown the feat is technically possible. According to Petrich though, even if it is 100% working, he doesn't intend to release a "bootlegged" copy due to software distribution rules. However, there may be ways to work around such legal matters, or perhaps someone with fewer scruples can take over his work. Meanwhile, Google is rumored to be working on their own official mapping solution for iOS.